Lots of highs and a few lows from yesterday's 5k in Topeka. My hope was that I would improve my time but I was 1 second slower than my last 5k. My time was 28:52 yesterday. The race started at 3 pm so that was a little bit of an adjustment but I don't think it had any effect on how I ran. I strained my right calf in the first half of the race and it's still sore today. It's a little bit better right now. Also, my gut started aching around the same time and I wasn't sure if I was going to throw up or what. It lasted the rest of the race and about 10 or 15 minutes after. I had a decent breakfast, my usual oatmeal with flaxseed meal and also some strawberry greek yogurt. Lunch was lighter with just some vegetables. Looking back, I didn't drink near enough water both in the days before the race as well as yesterday morning and leading up to the race. Maybe a sports drink would have helped some too. After the race, I went to a sports bar and "celebrated" by ordering whatever I wanted. I overdid it on what I ate and my wife told me she saw the old me. I felt that way too. I inhaled my food and had a lot of it. I had a cheeseburger, onion rings and a beer. I can't forget the spinach and artichoke stuffed mushrooms before my meal either. I also helped my wife finish her french fries. I was definitely the old Shawn for one meal. None of what I ate gave me the pleasure or satisfaction that losing 95 pounds or being a healthier person has. It was good to get that out of my system to remind me that I'm not missing anything. On the bright side of things, I FINISHED ANOTHER 5K. I didn't stop running once as much as I felt like it and I still finished strong and with a decent time. I've come a long, long way from eating like a pig to where I am today. If I'm going to keep this up, I really need to run and exercise on a more regular basis. 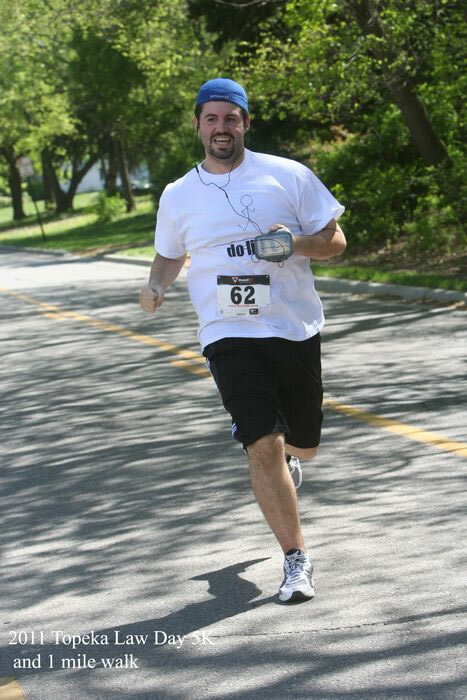 I am looking forward to my next 5k on June 4th. Thanks, Marci. The hat starts out forward but then it turns into a rally cap and I turn it around towards the end of the race.